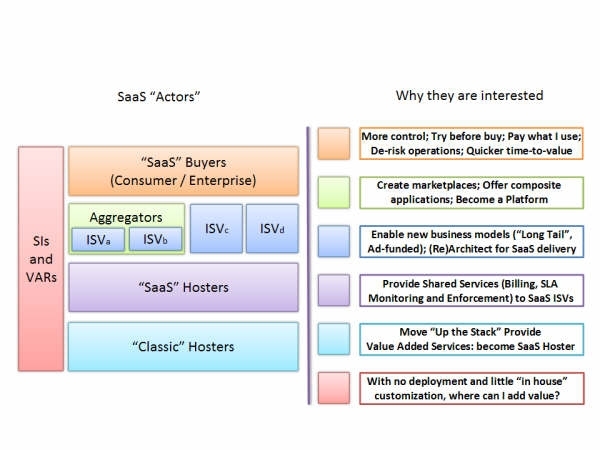 The graphic below provides a summary of the dynamics of the SaaS marketplace. Naturally since SaaS have a lot of buzz right now everyone wants a bit of the pie and Gianpaolo Carraro provides a great description (and the image) on his blog of the different players and the most natural strategies that they can take to take advantage of the this growing market. Whilst I don’t personally have a lot of involvement with active SaaS projects I recently took a look at a few areas where I have seen SaaS proving popular with customers that I work with and I saw an interesting trend. Lots of interest in SaaS during the early phases of the lifecycle, however once a products value was accepted in the enterprise and its usage grew substantially most of the SaaS services were brought back into the enterprise. I am sure that won’t always be the case but it was surprising consistent.